Just a little note here, I made this tutorial as simple as possible. 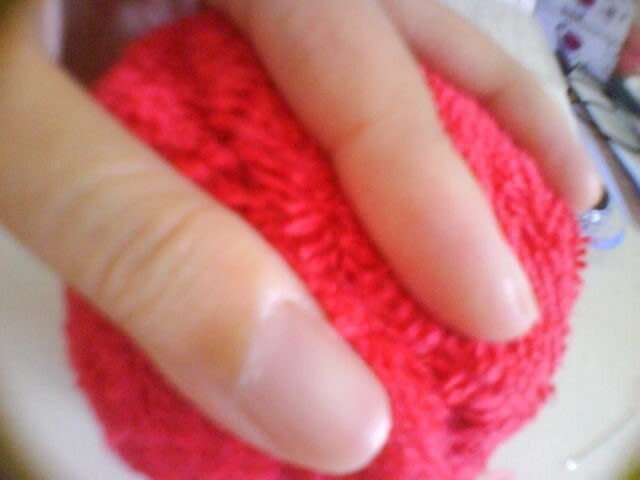 But please do remember that you will count on your fingers and instinct, perhaps a little more than you expected. 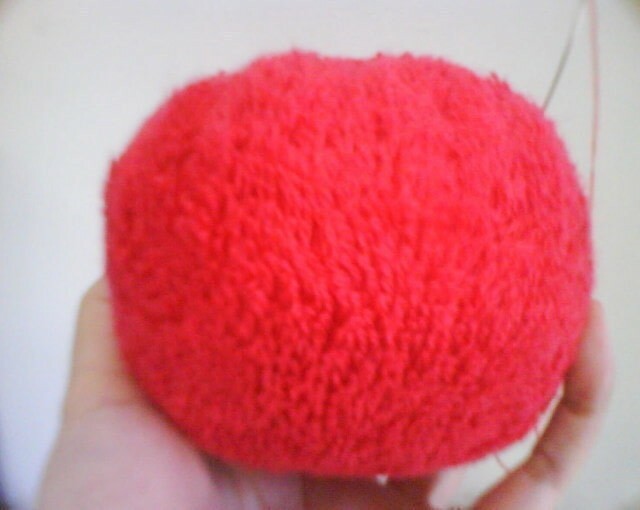 What I mean is, not because this is a hand sewing project, but you will rely on your fingers to help the plush shape as much as apple-like since the pattern is actually only an ordinary round shape. 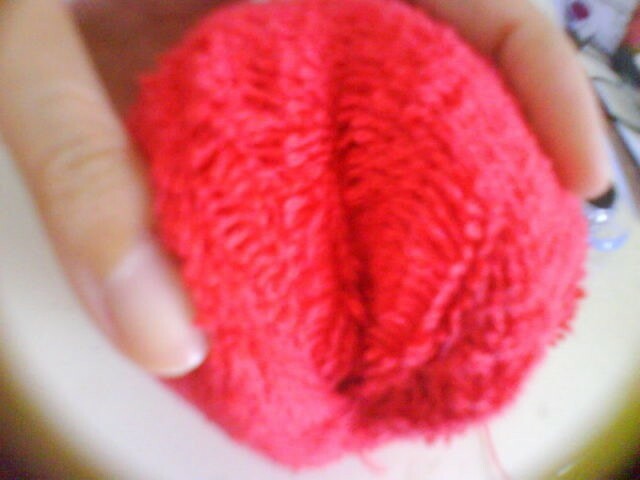 You will have to fold them here and there as directions in the tutorial to make a 3D apple plush. So you can say, I made this with a little folding technique since the apple is actually only a stuffed yoyo. 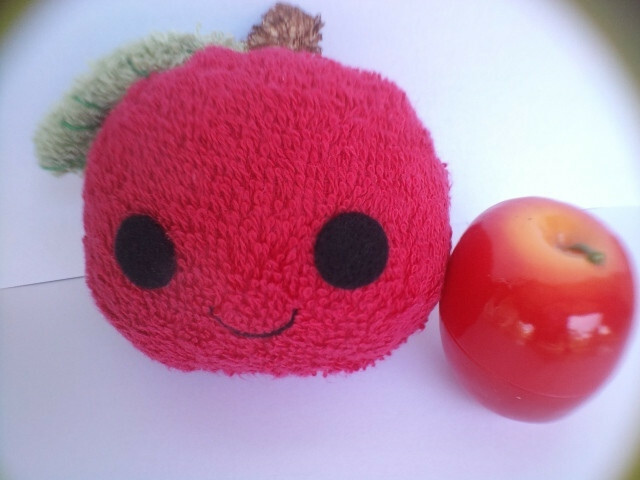 More or less your result will be a real apple sized-plush! 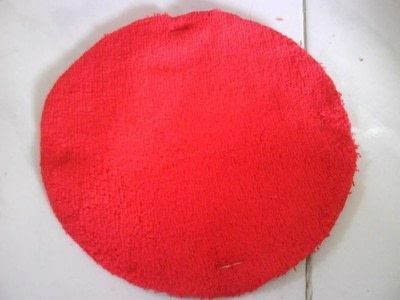 Put your red fabric on the floor. Pin your pattern on and mark it. Cut exactly on where you mark. No need to add seam allowance for this one. Stuff with polyester fiberfill firmly. Make sure you fill all the spacewith the filling. Stick in your finger a few times to make sure. 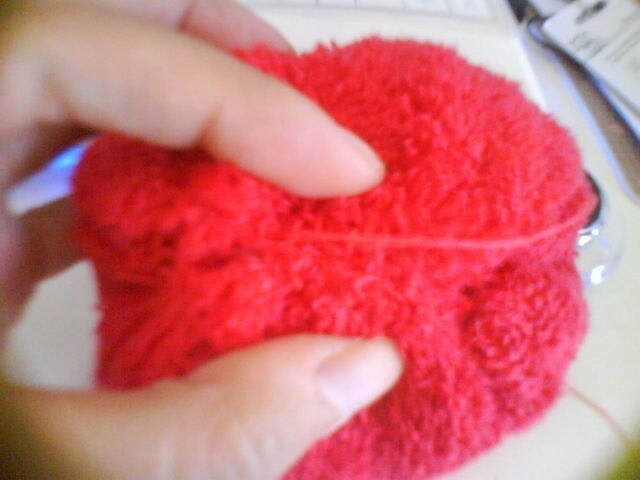 Pull the thread again until the hole is as small as possible. and sew the opening until it’s closed. Now here we start the folding. Hold the stuffed apple like here in the pic, it’s like folding half of the apple. Sew carefully where the opening existed before. We are trying to secure the ex-opening and make it neat – also shaping the apple at the same time. 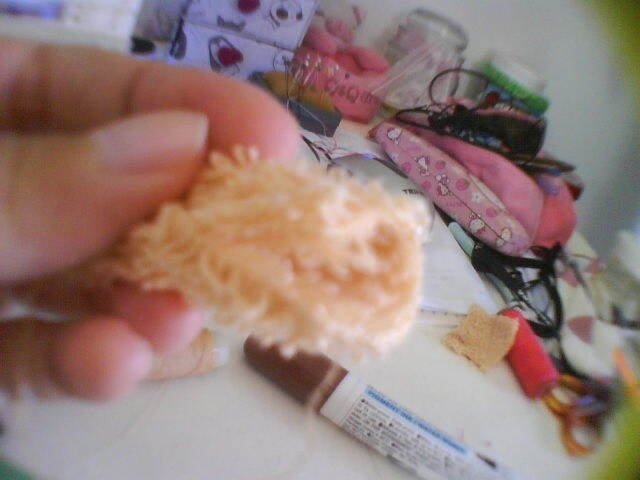 When the two side of it already been sewed you will see a weird big folds on each of two other sides of the apple. Now here you need a lot of help from your fingers. 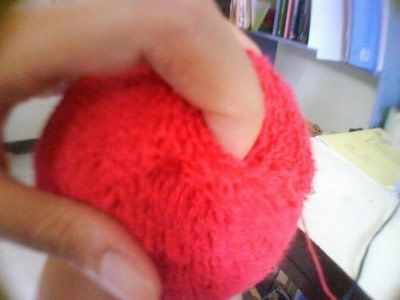 Stuck your fingers into the “hole” and meet the two sides of “hole” to close it. You will need to use your finger to exact the shape since this is crucial for your apple’s shape. 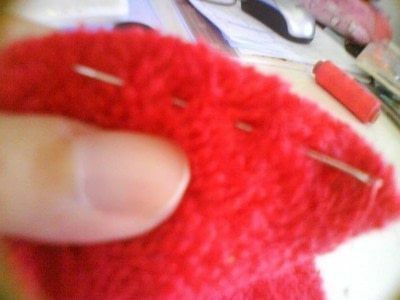 Your fingers need to be sticked in a few times to the inside folds to make sure you got the right shape you want Sew. Repeat to the other side until both “hole”s are closed. Draw a leaf on a paper for the patern and make the leaf plush to put on top of the apple. 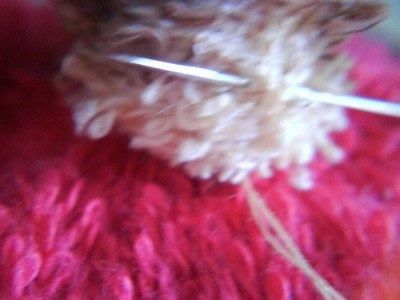 Remember that you will need to add seam allowance. Tips: if you think the leaf is too ‘fat’ you can iron it, just simply replace it under a thin fabric and iron. 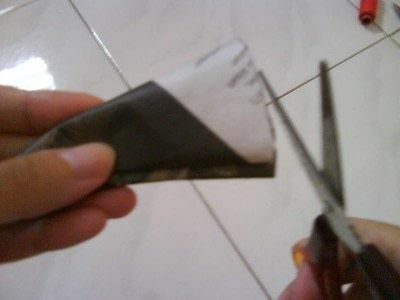 For the brown twig, I made it from a leftover fabric, cut it as a small rectangle and sew two sides, stuff it a little bit, and close one opening side after folding it inside – and then sew it to close the opening. One side is still opened, you will stick this side to the apple. thank you! 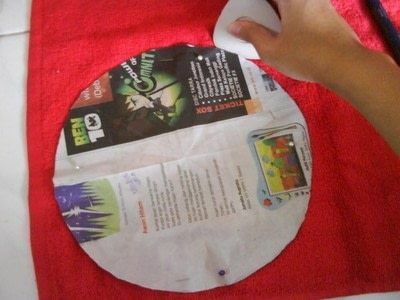 I used towel, so if you have a hand towel or even an old towel, this would work well too. So cute! What fabric did you use? Adorable! Thanks for sharing how you made it. love it! 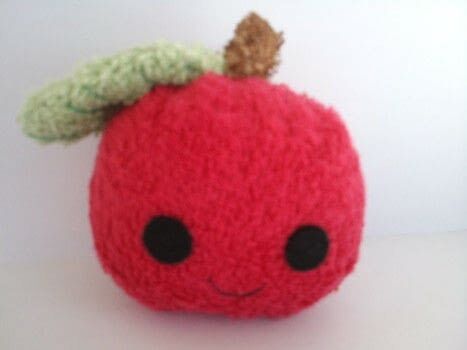 never seen such cute apple! !